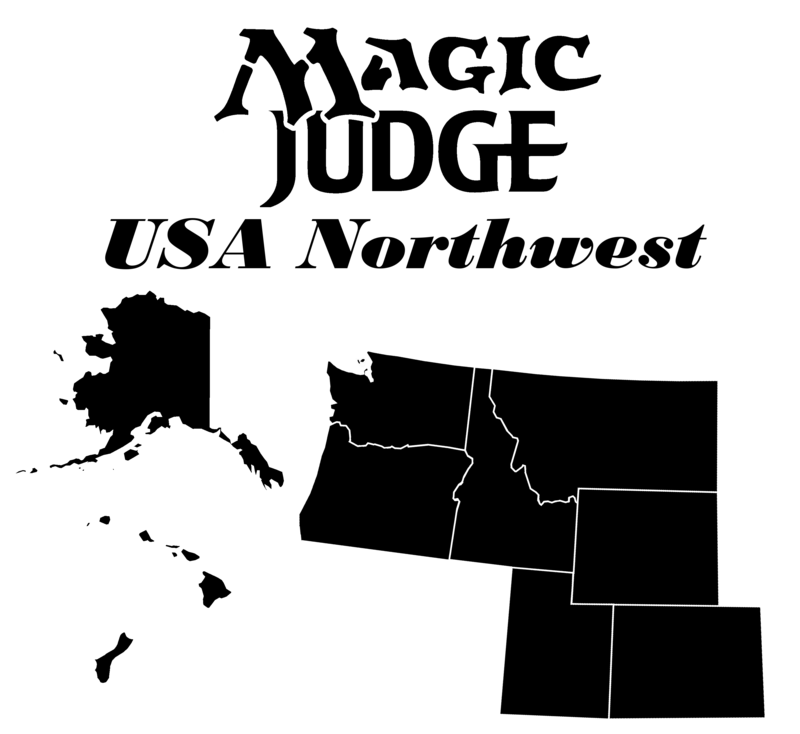 Welcome Judges of the Northwest, to an Iconic Contest! Today we’d like to start our region off with something fun: a contest! One of the things many other regions have done is create an individual logo- something the region can put on items to represent themselves, and, being such a spread out region, we felt we could do well with a logo of our own. This is an example. Please don’t copy this! (Credit to Neil Pendon, L2 from Guam! Therefore, we’re going to open it up to all judges of our region as a contest, to design, create, and innovate a logo to represent the Pacific Northwest! If we were the Izzet, we would suggest you “die trying” (But we’re not, so we won’t)! -Please make sure your image is vectored! -No copyrighted material! This means no mana symbols, no art from Magic or any of your 2nd favorite CCGs. We want this to be original, awesome, and exciting for our region to see! -No maps! We already have a decent map image (some of you have it on the backs of your hoodies! ), so let’s try to have something different than that! See the top image for an example of the map we already have and is awesome! We’re going to make the prize for this pretty amazing- so we’ll be offering you a iconic prize! We have been working on getting playmats printed for some time, and one of the reasons we’ve held off is that we wanted our logo on it! So, if your logo is selected, you’ll get to see it on our regional playmat! And you get one yourself, for free! Since we also want our region to have more strength (of isolation), we feel you could “be a Force in the Northwest for creating our logo!” Yes, that’s right, a judge Force of Will is the prize for the winner! Contest will close in one month, on October 31st, 2018! Please submit logo designs to PNWjudges@googlegroups.com! The winner of the contest will relinquish any and all rights to the image(s) they submit. By entering this contest, you agree to that stipulation. We want this to be an open use logo for the region’s projects! Thank you! The voting body will be the Area Captains of your region (who can’t vote on their own logo if they submit one)! We hope you decide to submit a logo! Happy arting!